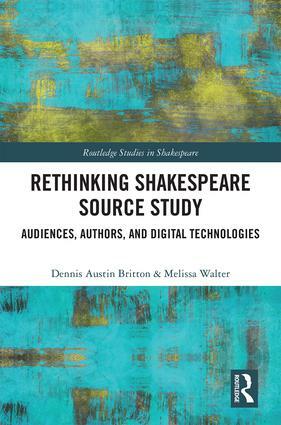 This book asks new questions about how and why Shakespeare engages with source material, and about what should be counted as sources in Shakespeare studies. The essays demonstrate that source study remains an indispensable mode of inquiry for understanding Shakespeare, his authorship and audiences, and early modern gender, racial, and class relations, as well as for considering how new technologies have and will continue to redefine our understanding of the materials Shakespeare used to compose his plays. Although source study has been used in the past to construct a conservative view of Shakespeare and his genius, the volume argues that a rethought Shakespearean source study provides opportunities to examine models and practices of cultural exchange and memory, and to value specific cultures and difference. Informed by contemporary approaches to literature and culture, the essays revise conceptions of sources and intertextuality to include terms like "haunting," "sustainability," "microscopic sources," "contamination," "fragmentary circulation" and "cultural conservation." They maintain an awareness of the heterogeneity of cultures along lines of class, religious affiliation, and race, seeking to enhance the opportunity to register diverse ideas and frameworks imported from foreign material and distant sources. The volume not only examines print culture, but also material culture, theatrical paradigms, generic assumptions, and oral narratives. It considers how digital technologies alter how we find sources and see connections among texts. This book asserts that how critics assess and acknowledge Shakespeare’s sources remains interpretively and politically significant; source study and its legacy continues to shape the image of Shakespeare and his authorship. The collection will be valuable to those interested in the relationships between Shakespeare’s work and other texts, those seeking to understand how the legacy of source study has shaped Shakespeare as a cultural phenomenon, and those studying source study, early modern authorship, implications of digital tools in early modern studies, and early modern literary culture. Dennis Austin Britton is Associate Professor in the Department of English at the University of New Hampshire, USA. Melissa Walter is Associate Professor in the Department of English at University of the Fraser Valley, Canada.